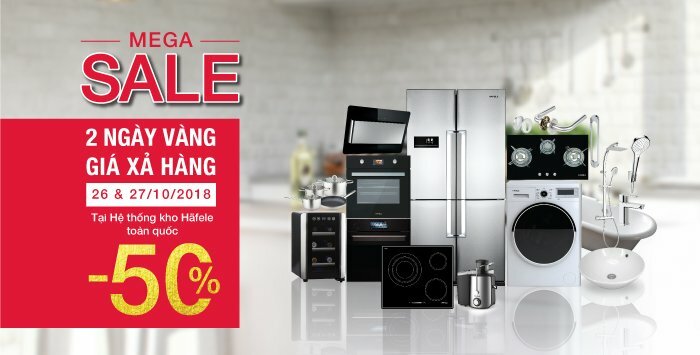 On 26 & 27 October, Häfele will hold a special promotion program, offering discounts up to 50% for thousands of items at warehouses in HCMC, Hanoi and Da Nang. The 02-day-only program will be applied for a wide range of products, including home appliances (induction hobs, ovens, fridges, sinks…), sanitary accessories (showers, lavabos, toilets, cutlery trays, bath towel racks…), and fittings for the kitchen and fittings for doors. All the products are from Häfele as well as other famous brands of the Europe such as Blanco, Blum, Bosch, Duravit, Geesa and Hansgrohe. Location: Sen Hong Stage – Taka Plaza gate – 4, Pham Ngu Lao District, Pham Ngu Lao Ward, D1. Note: First come first serve! Customers do not need to register the bus slot and the bus will depart as soon as all seat are filled. For further information, please call Häfele’s hotline 1800 1797.